Salinity is a significant management challenge and poses ongoing environmental, social and economic risks in the Murray-Darling Basin. The Murray–Darling Basin Authority (MDBA) and Basin governments have a long and successful history of working together to manage salinity. 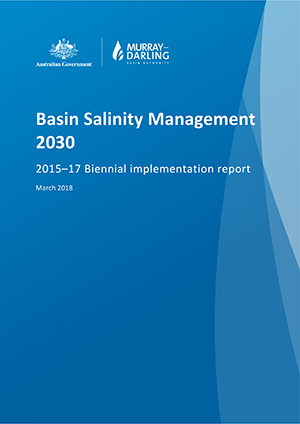 The current strategy (BSM2030) has been in place since 2015 and will deliver a program of coordinated salinity management until 2030.
undertake a major strategic review to ensure the strategy continues to guide effective management of salinity in the basin. This strategy, Basin salinity management 2030 (BSM2030), builds on the successes of the Basin salinity management strategy (2001-2015) to deliver a strategic, cost-efficient and streamlined program of coordinated salinity management for the next 15 years. Under the BSM2030 strategy, every second year the MDBA is required to prepare a BSM2030 status report. This is the second BSM2030 status report prepared by the MDBA, providing an update on strategy implementation. The 2015–16 year was the first year of reporting on BSM2030 strategy implementation. Throughout 2015–16, the MDBA and partner governments concentrated on first developing and then implementing the BSM2030 strategy. This report reviews the adopted hypothesis that Mallee vegetation clearance and its replacement with shallow-rooted dryland farming systems results in enhanced root zone drainage and increased (but delayed) groundwater recharge that would drive more salt into the River Murray. This report reviews the approaches and assumptions used to estimate the salinity impact of pre-1988 irrigation development in the Mallee region, focussing specifically on how irrigation accessions and recharge are estimated and implemented by the salinity register groundwater models.